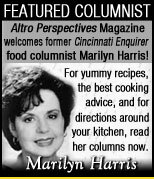 Home Articles & Columns Food & Restaurants Food & Restaurants Fun, Fancy Salads! Those Altro P Magazine readers who are always looking for cool and unique dishes should discover the classic Thai beef salad yum nuar. It's great in the summer, but works well in the transition months as well, while we go from cold to warm or warm to cool - so this dish is great to pair with a warm bowl of soup! A spicy mélange of grilled flank steak tossed with fish sauce, chiles, and fresh Thai basil and served with assorted vegetables, yum nuar is served at room temperature. The crunchy vegetables contrast nicely against grill-charred rare beef, and if the peppers provoke a sweat, so much the better. Yum nuar is easy to prepare at a picnic; just slice the veggies and toss with the dressing beforehand, then grill the meat and cut it into strips. To start your spring-on-the-patio weather early, you could make this salad quickly and easily as it can be paired with a warm thai, coconut or veggie soup for your 'soup and salad' combo as we transition from winter to spring. Or - you may serve as part of a fun holiday appetizer for any parties you have indoors during your winter holiday break! Here’s my version, with extra vegetables and lots of Thai aromatic spices. Habanero pepper complements Thai flavors beautifully; try it if you can stand the heat. Serve it with a cold bottle of German Riesling, or your favorite beer. Grill the beef over a very hot charcoal fire, or under a broiler, or sear it in a heavy, very hot pan. Cook until a nice crust develops on the outside, and the inside is rare to medium rare. Transfer to a cutting board. Slice thinly, cutting against the grain at all times into 2 inch by 1 inch strips. 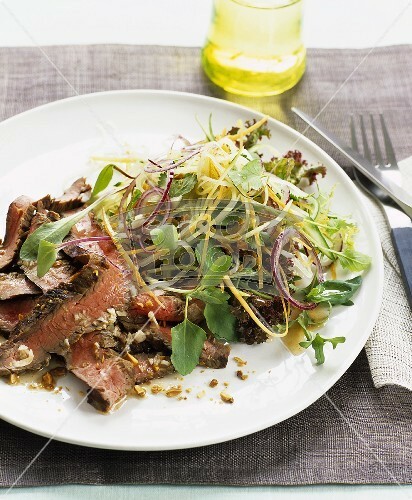 Put the beef and its juices in a bowl that can accommodate all the ingredients. Slice the cucumber in half lengthwise. With a spoon, remove the seeds and pulp. Slice each half crosswise into ¼ inch slices. Add to bowl. Add the red pepper, red onion, green onion, tomato, garlic, lime leaves, basil or mint, galangal, chile, and cilantro to the bowl. Add the fish sauce, soy sauce, lime juice, kecap manis, and sugar to a small mixing bowl. Stir to dissolve the sugar. Add the white pepper. Pour the dressing over the salad, and toss to combine. Serve at room temperature, with Bibb lettuce leaves as a wrap for the salad.